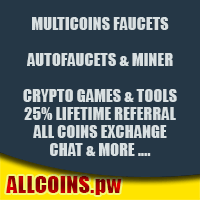 Earn more crypto with the referral system of Allcoins.pw ! The person you referred will be linked to your account forever. You will earn 25% of his claims earnings ! It can be really lucrative if you know some peoples or if you have a blog, website, forum, or any other way to promote your referral link ! tag to get the slider banner on bottom left.